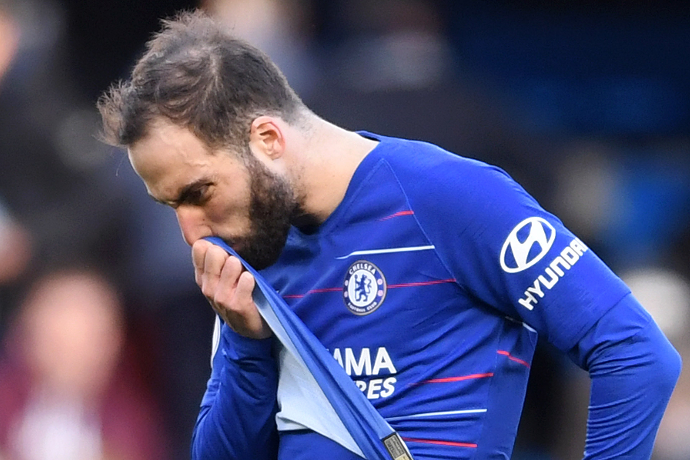 Gonzalo Higuain has conceded that his performances have not been up to scratch since swapping AC Milan for Chelsea in January, according to boss Maurizio Sarri. The Argentinean has netted just three times for the Blues since arriving at Stamford Bridge following a protracted transfer saga, and his contributions have done little to improve the team’s lot as they have slipped off the pace in the race for the Champions League. Sarri had hoped Higuain would re-discover the kind of form that saw him score 36 goals when the two were together at Napoli during the 2015/16 season, and made it clear throughout the transfer window that the striker was his top target. But the physical demands of the Premier League have proved a strain on the 31 year-old, who compounded his difficult season by announcing his retirement from international duty on Thursday. “He said to me that it’s difficult, because the physical impact of the defenders here is really very strong,” said Sarri. “The referees here are really very different than in Italy, and so it’s another football for him, especially for a striker and a goalkeeper, it’s really very different. Chelsea have appealed against a two-window transfer ban from FIFA, leaving Higuain’s future up in the air beyond the end of the season. Asked if Higuain will be at Chelsea next term, Sarri replied: “I don’t know, I’d like to see him at the top in the last two months. “At the moment only this is really very important. We need Gonzalo at the top. It’s not easy I think to get used to this championship.